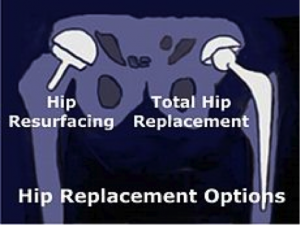 This page contains information about total hip resurfacing. If any questions remain unanswered please ask your doctor or specialist. Hip resurfacing – can be an alternative to a hip replacement as it is a less invasive operation and recovery time is quicker. It involves removing the upper surfaces of two areas of bone – the femur (thigh bone) and the cavity in the pelvis where the femur sits. A metal surface replaces the bone, so instead of bone on bone the end result is metal on metal. The procedure requires relatively strong bones, so it is not suitable for people over 65 or women who have gone through the menopause. Whilst there are some obvious causes for hip joint arthritis (injury or rheumatoid arthritis), sometimes no obvious reason is present. Hip resurfacing can relieve sufferers of pain and mobility problems. However the procedure requires relatively strong bones, so it is not suitable for people over 65 or women who have gone through the menopause.